Palladianism as we see it in Ireland emerged in the early 18th century, heavily influenced by English practitioners and theorists such as Colen Campbell whose Vitruvius Britannicus was published in 1715, and his patron Richard Boyle, 3rd Earl of Burlington (and also, let it not be forgotten, 4th Earl of Cork, since he was a large landowner in this country). 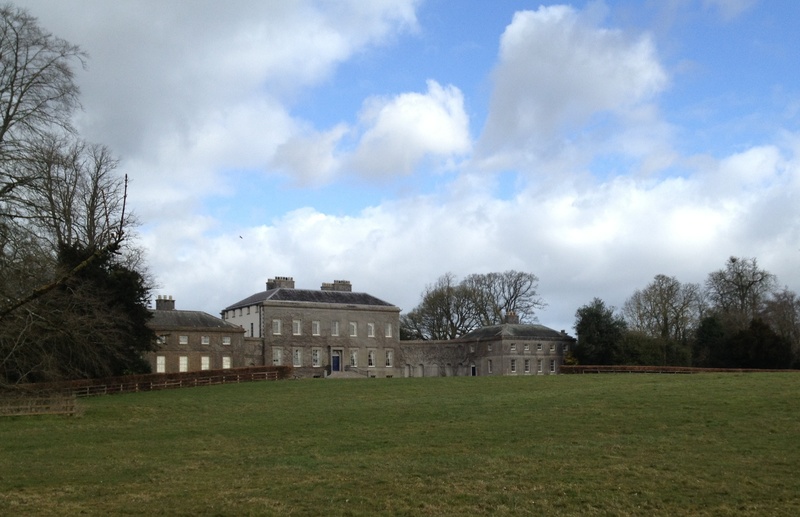 The first indisputably Irish Palladian house is Castletown, County Kildare on which work began c.1722 with its facade designed by Florentine architect Alessandro Galilei (1691-1737), today best known for his work at the basilica of San Giovanni in Laterano in Rome. One aspect of Palladianism often overlooked is its functionality: seduced by the beauty of the overall design we are inclined to forget these buildings were intended to serve a practical purpose. In the 16th century many of Palladio’s clients were wealthy Venetians who owned country estates on which they wished to spend the summer months. The estates were working farms, and the houses Palladio created at their centre reflect this reality. Because of his admiration for classical design and the importance of symmetry, rather than permit a variety of stand-alone farm buildings scattered across the site as had customarily been the case, he consolidated them into a single unit. Thus the archetypal Palladian villa is dominated by a central residence with a facade inspired by Roman temples (hence the frequency of pedimented porticos). On either side of this block run a series of lower wings symmetrical in appearance and practical in purpose. Behind their calm and orderly exteriors a quantity of different activities would take place, whether the preparation of meals or the storage of grain, the housing of livestock or the washing of clothes. There would be stables and dovecots, piggeries and chicken coops, all of them part of a single harmonious unit. The concept was both simple and yet sophisticated, rational yet handsome. In the late 19th century the American architect Louis Sullivan proclaimed ‘form ever follows function.’ Palladio’s villas demonstrate the truth of this maxim. As his influence spread beyond Italy, so too did his designs and the practical philosophy that underlay them. 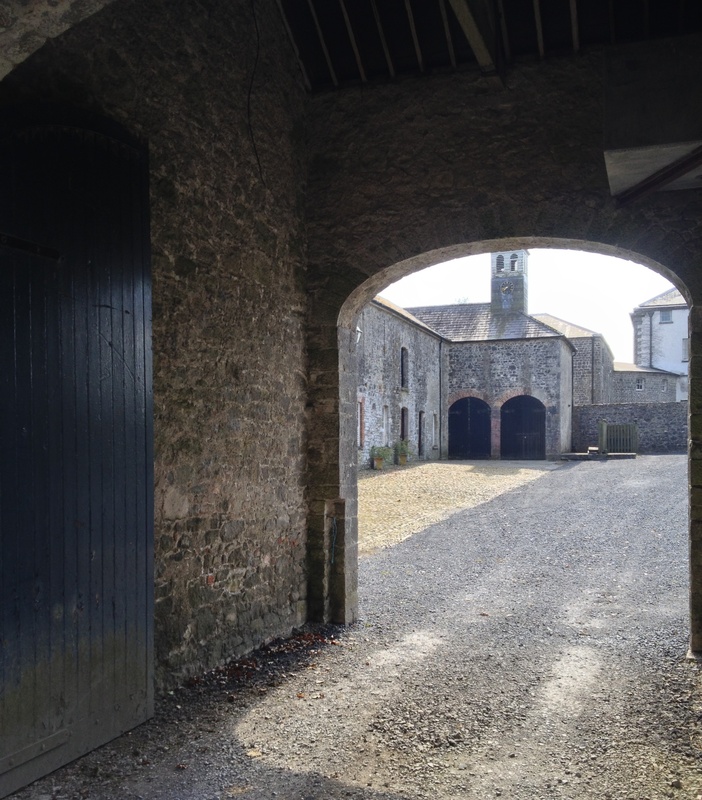 This approach found a particularly warm reception in Ireland where from the late 17th century onwards landowners sought to bring order to their estates and to create new residences at their core. 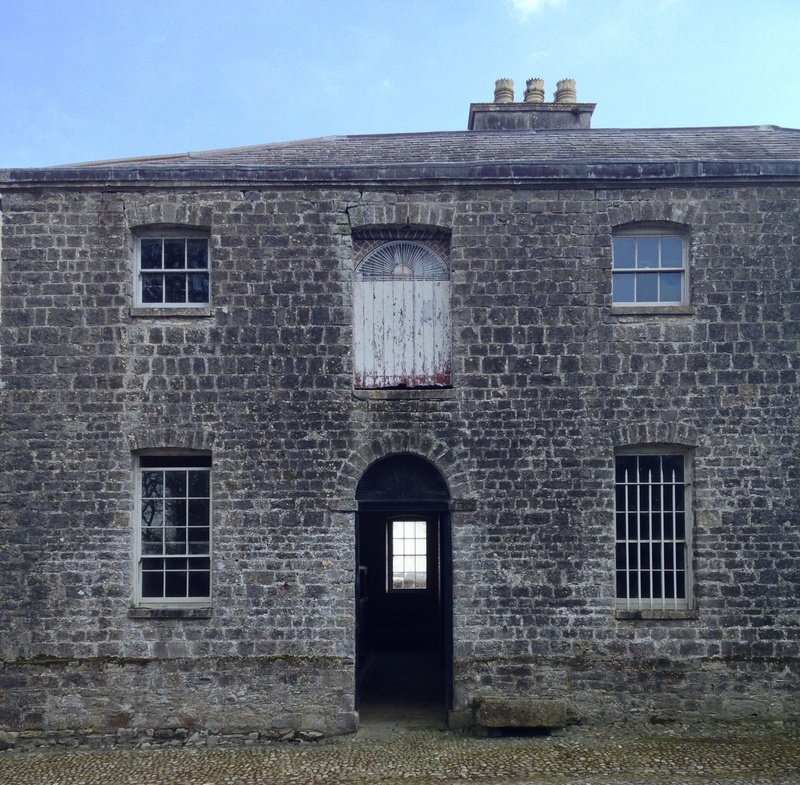 One such estate was Ardbraccan, County Meath. This had been the seat of a bishopric for over a thousand years and in the 16th century a large Tudor house called St Mary’s stood there. However by the early 18th century the old residence had become so dilapidated that a new house was deemed essential. In 1734 then-Bishop of Meath Arthur Price made a start on the project but within a few years he had been transferred to the Archbishopric of Cashel (where incidentally he was responsible for unroofing the old cathedral, seemingly because he found his carriage could not easily be driven to the top of the hill on which it stands). It would be another 30 years before the work initiated by Price was brought to completion, but the two wings of the building he commissioned were completed before his departure. The architect employed for this task was Richard Castle, whose personal history remains somewhat shrouded in mystery. He is believed to have grown up in Dresden, where his father, an English-born Jew named Joseph Riccardo, served as Director of Munitions and Mines to Friedrich Augustus, Elector of Saxony and King of Poland. By 1725 Castle, sometimes called Cassels, had come to England where he is likely to have encountered Lord Burlington and his circle of Palladians. Three years later he moved to Ireland, supposedly at the request of Sir Gustavus Hume, to design Castle Hume, County Fermanagh. Not long after Castle began working as a draughtsman for Sir Edward Lovett Pearce on the plans of the new Parliament House then being built in Dublin. Following Pearce’s death in 1733 Castle took over some of his unfinished commissions and also became the most notable designer of country houses in Ireland. He was, therefore, the obvious choice when Bishop Price sought an architect for the new residence at Ardbraccan. 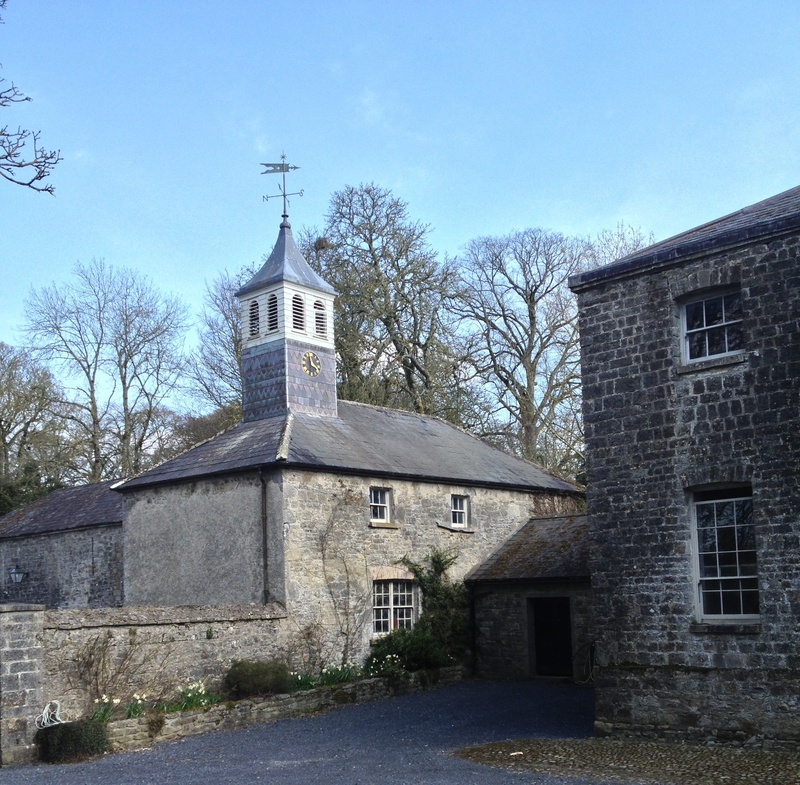 Understandably visitors to Ardbraccan focus their attention on the main house, finished in the 1770s to the designs of no less than three architects: James Wyatt, Thomas Cooley and the Rev. Daniel Beaufort. As a result, the rest of the structure receives less notice, even though it offers one of the purest examples of Palladianism in Ireland. To north and south of the central block run arcaded quadrants that link to two-storey, five-bay wings, their entrances facing one another across the house’s forecourt. The facade presented to the world is one of order and equilibrium, harmony and proportion. In classic Palladian fashion Castle provided facilities for a wealth of complementary domestic and agricultural activities, all housed in splendidly constructed outbuildings that remain intact. These include stables and carriage houses, kitchens and laundry yard, pump yard and slaughter house, piggeries, granary, dovecotes, cattle sheds and fowl yards, accommodation for the large community of workers who engaged in diverse activities, and rising above them all a clock tower to ensure time was kept on the day’s tasks. One of the pleasures of these buildings is the quality of their finish, a tribute to Irish workmanship at the time. 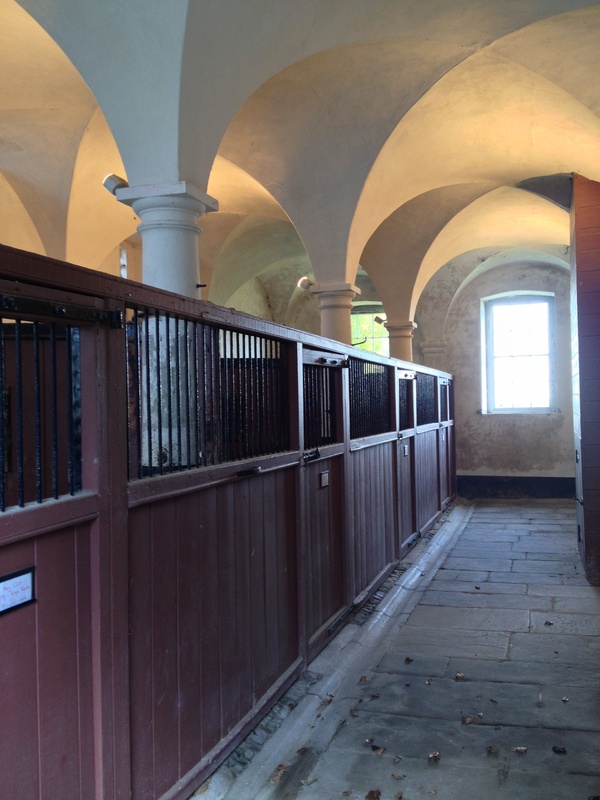 It is worth noting the way different sections interact; the mixture of cut and uncut stone within the stable block to the north, for example, is surprisingly successful. 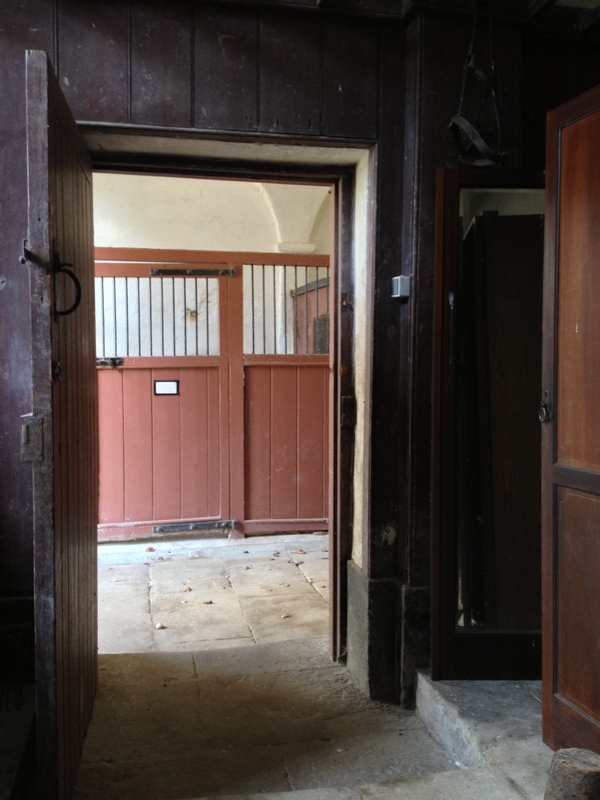 On this side of the house a Gibbsian door permitted the bishop to descend to the yard via a flight of handsome steps, and then climb another short sequence to the mounting block for his horse. 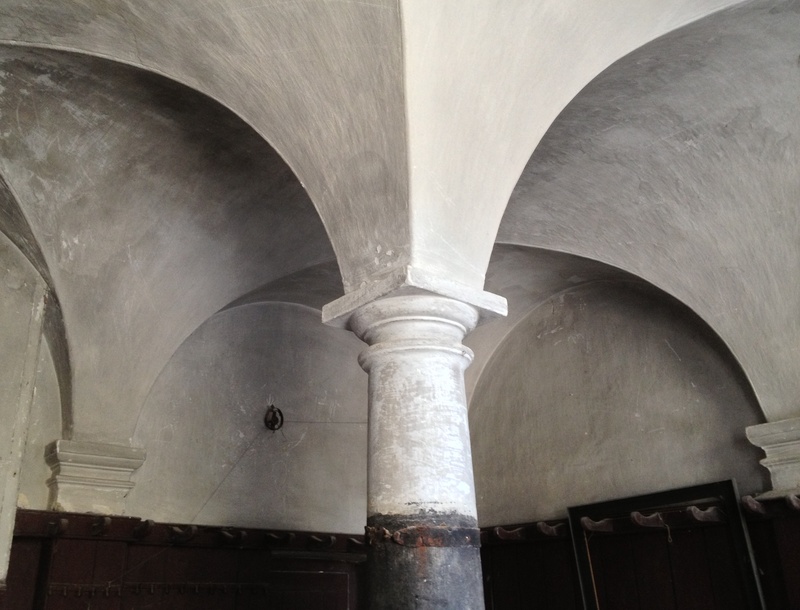 Inside the wing itself look at the superlative groin vaulting in the stables, the vaults carried on solid Tuscan column. Elsewhere the interplay of curved wall and staircase is another delight. 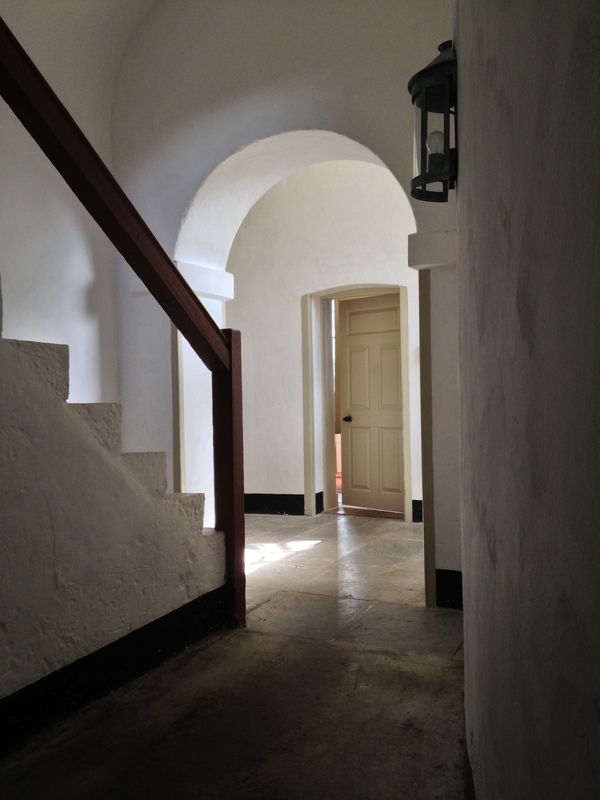 These were all practical spaces, intended to ensure the estate operated smoothly and would be almost self-sufficient. Nonetheless as much attention was paid to their design and construction as to the episcopal residence. Here are the tenets of Palladianism put into practice and showing their mettle. This entry was posted in Architectural History, Country House, Meath and tagged Architectural History, Ardbraccan, County Meath, Georgian Architecture, Irish Country House, Irish History, Stately Home, The Big House. Visited the Connolly and Cleary exhibition at The Casino @ Marino on Saturday. The exhibition itself was interesting and well executed, however, it was the building itself that reminded me that we have indeed some perfect jewels of architecture in Ireland that combine order, balance and functionality. It is very nice to be able to read a well written, accurate piece about the Irish visual landscape on the blogosphere. Keep up the good work. Thank you for your encouraging remarks. And if you have not already done so, look at the piece I wrote on the casino a few weeks ago (Casine Royale, March 25th). And thank you again for your interest. Until recently, I harboured no interest whatsoever in Irish Architecture or its splendid heritage. Then (I suspect through Fifth Columnist’s blog, another chance find) I discovered yours, I think your strap line: ‘This is not an Oxymoron’ probably caught my eye. All your articles are interesting, beautifully expressed and superbly illustrated. The fact that in my ignorance I often haven’t a clue about many of your no doubt well researched references does not detract from my reading enjoyment. Rather, I am encouraged to use the internet web thingy (when it works in this Godforsaken country) to research them and learn more. This must require a huge intellectual effort on your part and I am very grateful you are willing to share the results with us. I am sure it is not often one could obtain such scholarly prose composed in a manner drawing the reader into the story, making history come alive, gratis. One of the reasons I started this site was precisely to engage the attention of readers outside Ireland in the country’s architectural heritage, so your comments demonstrate that this ambition is being realised. It does take up a certain amount of time but on the other hand, the subject is close to my heart. My Friends?!! NOOO, I don’t think so. We all have gravel rash on our knuckles and tend to use objets d’art as weapons to settle frequent disputes. You will have gathered I missed the bronze. The auctioneers have not yet posted the results. Any idea what it went for? Just so I can torture myself. Oh dear, I was there for the weekend helping to pack up, so could have found out then; will try to remember to find out and let you know as soon as I do. Fantastic article as always, so much useful and interesting information. Love the pictures too, especially the working areas. It is images like these (and the bells!) that help me gain a real sense of how these houses must have “worked”. And it’s comments like yours that keep one enthused about this site! I am originally from the Ardbraccan area, I heard that the house was sold recently, do you know if the new owners will be opening the house to visitors. I have the domain http://www.ardbraccan.com/ so if the new owners are interested in doing something useful with the website, I would gladly transfer it at minimal cost. I have yet to meet the new owners; once I do so and have more news I will get back to you. Fantastic article and very timely as that I’m assisting with the community-based Hidden Histories project in Sligo, part of the Peace and Reconciliation programme through Sligo LEADER Partnership Ltd. In fact, I plan to reference some of your excellent information in the book we’re doing, which includes a chapter about Hazelwood House. Sounds most interesting. You might also look at the piece I wrote on this site Sola, Perduta, Abbandonata on February 25th.